what "Science First" had occurred next. Robert Adler highlights the sudden brilliance of a select number of scientists, which actually seems to be a result of serious study and contemplation. You can literally see how ideas evolved through time and how each scientist discovered inner genius despite immense discouragement and conflict, not to mention religious persecution and their own human foibles. You can see how humans started to observe the exterior surroundings and then started to delve into the areas of cell structure and the invisible atom. This book presents scientists in all their human glory and the honesty gives each scientist a true personality. Many struggled to overcome physical and psychological adversities or were led to their death by their own natural curiosity. It was not uncommon for these individuals to be a living part of their own experiments. However, not even plagues could hinder scientific research and the work went on through time despite a seemingly eternal and chaotic war of life itself that seemed determined to thwart their efforts. Thales, Anaximander, Pythagoras, Aristotle, Aristarchus, Archimedes, Ibn al-Haitham, Copernicus, Galileo, Kepler, Van Leeuwenhoek, Newton, Joseph Priestley, Humphry Davy, Darwin, Gregor Mendel, Dmitri Mendeleev, Marie Curie, Guglielmo Marconi, Max Planck, Ernest Rutherford, Albert Einstein, Alfred Wegener, Edwin Hubble, Raymond Dart, Barbara McClintock, Claude Shannon, James Watson, Francis Crick, Rosalind Franklin, Karl Jansky, Lynn Margulis, Michel Mayor, Didier Queloz, Ian Wilmut and Keith Campbell all make their appearances. Robert Adler shows how Charles Babbage (1792-1871) and Ada Byron Lovelace were at the cutting edge of technology and how Babbage designed a machine that functioned like a modern computer. If you become especially interested in any of the scientists or chapters, there is a reference section for further reading. The index is perfect for your own research or for locating a subject of interest. I thought each chapter was perfect in content and it definitely made me more interested in reading about additional scientific discoveries. Quotes are found throughout the chapters and I was especially impressed by the letter Einstein wrote to Marie Curie who had to overcome great personal trials to achieve her goals. I liked how Robert Adler refutes the myth of Einstein being a slow learner and he makes his points most eloquently. Pictures throughout the text gives this book an additional dose of personality and the biographical information is especially interesting. Robert Adler presents a scientific journey through time that is filled with insight and a depth of clarity that is stunning. This is one of the most highly crafted books I've ever read. Not only does Robert Adler delve into complex ideas about physics, biology and astronomy, he makes the ideas accessible to readers who may faintly remember these subjects from high school, college or the news. 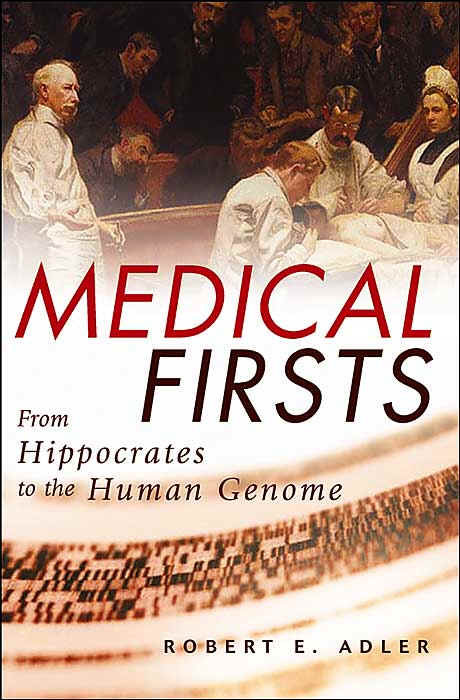 I can't wait to read his book about medical discoveries. 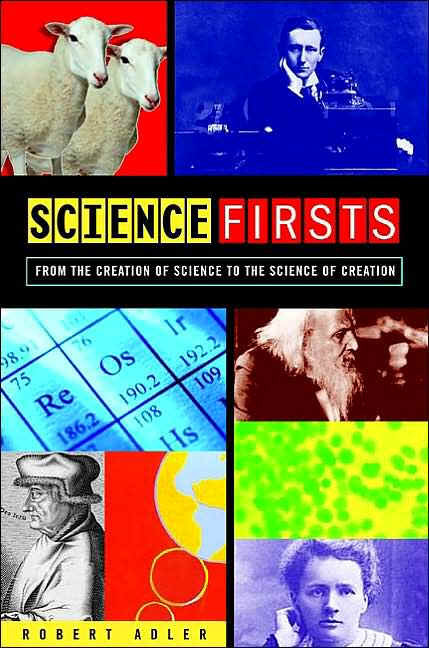 Science Firsts is truly a book about how scientific discovery changed the world. It is a fascinating read and I can highly recommend it to students of science, teachers and the casual reader who has an interest in progress itself. After reading this book, I think I might be ready to read about "the theory of everything." You may also enjoy reading the new Google/DK e.encyclopedia science: the ultimate online learning resource.